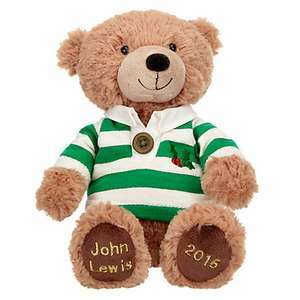 Christmas John Lewis teddy bear with rugby shirt.This is the small size bear and is reduced to £5.00.If you purchase over £30 no C+C charge~under that and you pay £2.00. You should not have to pay to C&C! Shame on you John Lewis! £3.50 for Collect + also. Damn. You should not have to pay to C&C! Shame on you John Lewis!Nothing … You should not have to pay to C&C! Shame on you John Lewis!Nothing against the deal.£3.50 for Collect + also. Damn. For... A teddy bear.... Lol.